I recently viewed a webinar about embedded librarianship in the community titled Leaving Fort Reference. As interesting as the webinar was, the content covered in the course is not what inspired this particular post - it was the title. The original webinar presented by the director and managers of the Douglas County Library System in Colorado, featured information on how to bring librarians to the community when the community may or may not be coming to the library. But, as the title implies, librarians are not just leaving their reference desk - they are leaving their brick and mortar buildings behind. As I began to think about the comfort levels of library staff in general, it occurred to me that some staff members are frightened to leave the reference desk, let alone the building. Before embedded librarianship can begin in the community, it should start with embedded librarianship within the building as a step toward excellent customer service. I will call it planted librarianship. The concept of roving reference is not a new one, and that is not specifically what I am talking about with planted librarianship. 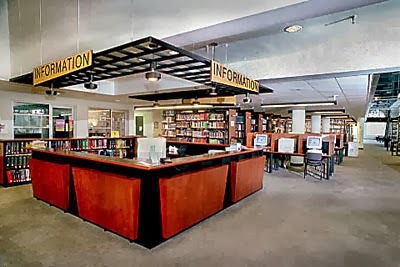 Roving reference suggests that there is a reference desk and librarians will occasionally step out from behind it and rove the stacks to find customers in need. At best, this librarian is equipped with an iPad to help answer questions without having to travel to the nearest computer. I have encountered numerous librarian social networks where a single librarian is looking to enhance the roving reference experience and the response, by an overwhelming majority of librarians, is to go out into the stacks with iPads. iPads are nifty little tools that are valuable for many things, but they are just a bandaid to a problem - not a solution. One information desk per floor. Or, if only one floor, one information desk for adult and one information desk for children. Or, only one floor with one desk for all departments. There is a fourth category that only a fraction of libraries fall into that includes abandoning the desk all together. It is this fourth category that I call planted librarianship. WHAT'S WRONG WITH ROVING REFERENCE? You might be asking yourself this question if you are a proponent of roving the stacks to seek out customers in need. But take a good, long look at how roving reference is being accomplished and when it is being accomplished. Chances are, no matter how many reference desks your library has, it is in the same boat as mine when it comes to staffing. The economic depression and budget cuts at a time when the library was seeing its highest number of visitors severely cut into the library's ability to staff appropriately. With just one desk to service all the library branch's customers, and having difficulty staffing the one desk, it stands to reason that staffing a roving librarian would be nearly impossible. The times when a library could staff someone to rove the stacks would be at times when this service is unneeded. Considering funding situations have improved for many libraries, your position on roving reference may be unmoved based on what I've described above. Therefore, I implore you to consider the following argument as well. People fear the desk and, depending upon its location, don't want to be bothered by walking the humiliating distance to ask a question. I use the word humiliating because, for some, it is. These customers would rather walk out with nothing than have to ask where something is located. Worst of all, this customer type will blame the organization instead of herself for being unable to find what she was looking for. I know this because I'm one of those customers. If you can not do roving reference all the time, then these customers are slipping through the cracks. Currently, I can list on one hand what I actually need at my reference desk: computer, library cards, paper and pencils (possibly a telephone, but that's debatable.) Everything else is just clutter. With this in mind, there is no reason why I can't move my reference desk into the stacks. One could set up a little station, much like the ones in Ikea, to meet the customers where they are browsing. Instead of having a bulky piece of furniture for a staff of four stationed at the forefront of the adult section, consider freeing up some of that space for a single work kiosk to accommodate one person and several other work stations strategically positioned throughout the collection. By planting librarians throughout the stacks, it makes asking a reference question a lot less daunting and enables the librarian to quickly see a customer who needs help . Moreover, it means continual roving of the stacks as it divides the area among staff and allows them to easily monitor a smaller section of the library. More visible presence of library staff throughout the building in this manner means that the likelihood of teens fooling around in those remote areas of your collection will diminish. This method may even be advantageous for the children's section as well. No matter how child friendly the desk is, most children are afraid to ask questions for fear of disturbing adults. Planted librarianship in the children's section will allow a more proactive measure to helping children. Asking a child if they would like assistance is more likely to yield a plethora of questions. From that moment, you've broken down a barrier and the child will be more likely to seek out help in the future. I'm certainly not the first to call for a change in the reference desk, nor will I be the last. But there is a reason why so few libraries have changed their reference desk model. As Sarah Watstein put it, "the reference desk is a powerful symbol and essential to the mission and purpose of academic reference service." While I would debate the essentials of a traditional reference desk, I must admit it has symbolic significance which keeps libraries from changing the model. But, as Steven Bell wrote in debate, "getting rid of the [reference] desk does not mean getting rid of the service." As with any major shift, there will always be pros and cons. Unless you are willing to give it a chance, you may never know if your reference services could be better.